Having recently published my website, I got to thinking about some of the content, in particular the evidence surrounding the illegal marriage of my great grand-parents, Mary Louisa Wilson and Charles Bertram Jones in 1902. Charles’ first marriage was to Mary’s sister, Frances Hebe, who died on 4 July 1902, just a few weeks before the marriage of Charles and Mary on 20 September 1902. At the time this marriage was illegal, a circumstance which changed with the Deceased Wife’s Sister’s Marriage Act of 1907. 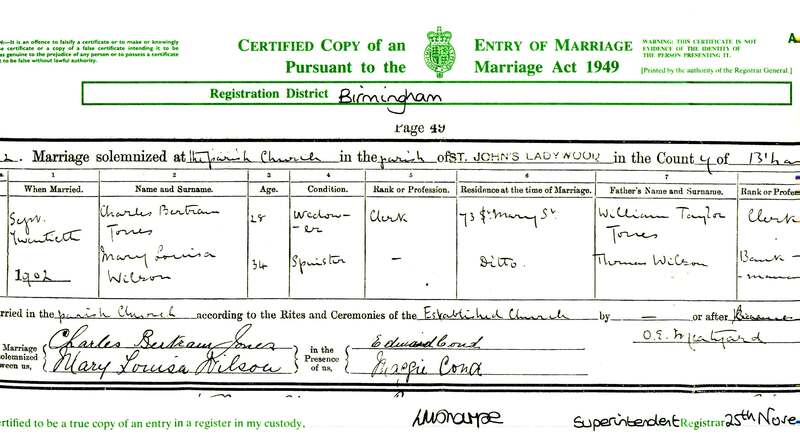 The marriage certificate gives the address of the bride and groom as 73 St Mary Street and took place at St John’s, Ladywood, Birmingham. The same address is given as the place of death on Frances Hebe’s death certificate, reported by Charles the day after her death. However, the 1901 census reveals that Charles and his first wife were living at 65 St Marys Road, Bearwood, Smethwick, Staffordshire, which is about 4 km from Ladywood. The two addresses are suspiciously similar so I tried to find St Mary’s Street on modern maps. It certainly does not exist now, but I know that many streets in Birmingham were obliterated when slums where cleared after World War II. Next I tried to locate St Mary’s Street on the 1901 and 1911 censuses using the search by address facility on http://www.findmypast.com, but to no avail. The next step is to find a contemporary street map and check there. I have a funny feeling that St Mary’s Street never existed and Charles Bertram Jones started laying a trail of lies the day after his first wife’s death!